I have thought a bit about these. I wish I knew someone I could borrow one from for awhile, test it out. I do love the feel of a book in my hands. I had the Sony version years ago then it just faded away and I was sad that no one was interested in it. When the Palm PDA came out with books available on eReader.com I was hooked again and haven't touched a real book 'cept my arty books since. I now read strictly from my iPhone. My husband has turned me into a real GG - Gadget Girl. I wanted a Sony Reader, but I was too late! 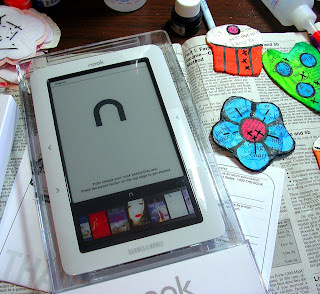 Now I have my eye on the Nook. How is it working out? Do you like it a lot? Does it download quickly? Can you share content? No other questions at this time, your honor.